In 2018, Acem School of Yoga will celebrate 50 years of teaching by arranging its first international yoga retreat, with instructions i five languages. The event takes place from 7-14 July 2018, at Halvorsbøle International Retreat Centre, Norway. Acem School of Yoga was founded before the first major wave of yoga reached the West, and over the past decade, a number of yoga instructors have received training not only in Scandinavia, but also in Germany, Spain and Taiwan. As a result, the retreat will offer yoga classes in English, Spanish, German, Mandarin, and Norwegian. Acem School of Yoga teaches classical yoga. The postures are carried out slowly, with coordination between breathing and movements. The yoga postures have significant effects on inner organs, muscles and circulation. We may start a yoga session feeling tired and end by feeling fit and full of energy. Doing yoga in this way contributes to relaxation and enhanced physical well-being. It reduces stress and helps us to be more attentive to the body’s signals, and to become re-energised for the challenges of life. The body movements during yoga sessions are made in a comfortable way with harmonized and synchronized breath, with rest and relaxation and a free-floating attention between the postures. This form of yoga strengthens both body and mind in more comprehensive ways than the kind of yoga gymnastics we often encounter in fitness studios. The international yoga retreat is open to beginners as well as experienced yoga practitioners. Acem Yoga emphasizes the meditative aspect of yoga and the integration of body, breath and mind in a way few if any other yoga schools do. The body movements during yoga sessions are made in a comfortable way, with harmonized and synchronized breath, rest and relaxation, and a free-floating attention between the postures. In the retreat, everybody learns to enjoy classical yoga, whether one’s body is fit, stiff or flexible. It will be a week of joy and laughter combined with work on postures that contribute to a vitalized body and a refreshed mind. 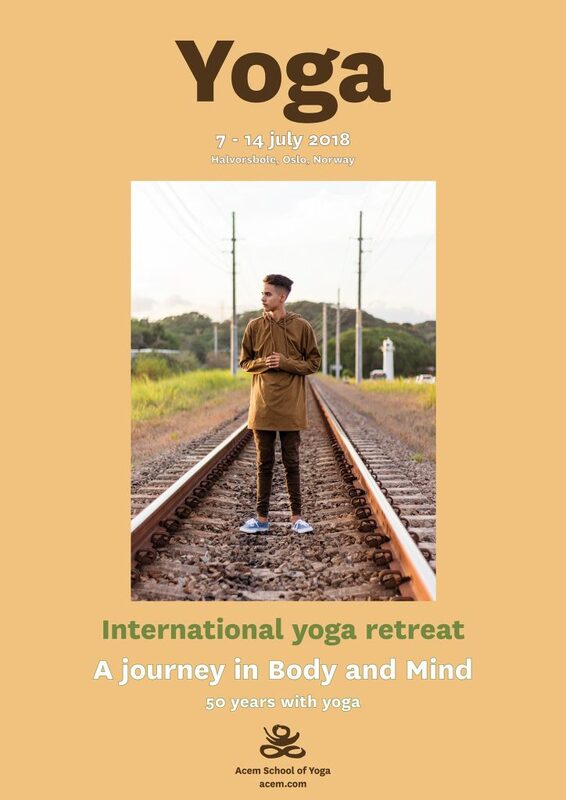 The international yoga retreat will be led by Mr Torbjørn Hobbel, who is an Acem Meditation Initiator, and Anne Thomte, who is head of Acem School of Yoga. Welcome to Acem School of Yoga’s first international yoga retreat – which may give you a new way of looking at your body and yourself. For more information, see HERE. Stay on for another week? For those who have previously participated in a weeklong retreat in Acem Meditation, there will be a unique opportunity to combine the yoga retreat with a deepening meditation retreat with Dr. Are Holen, which takes place 14-21 July 2018 in the same location.